Converse, its market share almost nonexistent now, has filed for bankruptcy. Its All-Stars may be history. Converse All Star basketball shoes were first manufactured in the USA in 1917. The “Chuck Taylor” signature was added to the label and its name in 1931. The navy blue color was introduced in the late sixties. Not many items that lie moldering — often fragrantly — at the bottom of thousands of American closets are worthy of poetry. An exception, however, is the Converse “Chuck Taylor” All-Star, a utilitarian canvas sneaker that a generation of sentimental baby boomers watched fall from its place as the most ubiquitous athletic accessory in history to become a quirky fashion afterthought. Monday, January 22, 2001, when Converse, almost hopelessly in debt, filed for financial protection under Chapter 11 of the U.S. Bankruptcy Code, the other shoe finally dropped. The 93-year-old company that invented and defined basketball footwear will be closing its three North American manufacturing plants. The All-Stars of the future - if there is a future - will be made by manufacturers in Asia, with Converse doing nothing more than lending its name to the product. Converse is reportedly more than $180 million in debt. It recently has missed several deadlines to repay creditors, and it was forced into the bankruptcy filing to avoid the total loss of its holdings. Converse’s stock, which sold for as much as $28 on the New York Stock Exchange in early 1997, was trading at 20 cents per share over the counter yesterday. How did the All-Star become a benchwarmer in the footwear trade? 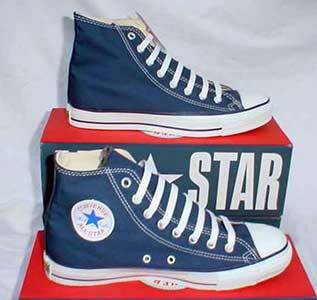 Since the shoe was introduced in 1917, Converse has sold 575 million pairs of All-Stars. At one time, the company controlled 80 percent of the sports footwear market. That slice is down to about 1 percent and still falling. “We certainly didn’t have the wind at our back,” Rupp told the Associated Press. Charles H. “Chuck” Taylor was a modestly talented basketball player from a small Indiana town, a journeyman who never went to college but who played for several industrial teams of his era - the Akron Firestones and the Buffalo Germans among them. He wore the All-Star when he played and talked his way into a job with Converse when it was time to move on, suggesting improvements and promising company officials that he could help sell the shoe nationwide. Over the next four decades, Taylor took the rubber to the road. He toured the United States in a Cadillac loaded down with boxes of basketball shoes. He visited high school and college coaches, stopped in at sporting-goods stores and spread the gospel of the Chuck Taylor All-Star. It could be ordered in black and white, in low-cut and high-top models. Eventually, Converse added a number of other shades so that teams could match the sneakers to their school colors. Making the basketball team at school has meant many things to boys and girls across the country. But at least through the 1960s, it meant getting a fresh pair of All-Stars, and that made everything worthwhile. Wilt Chamberlain scored 100 points in a pair of Chuck Taylors, Bob Cousy pivoted and dashed across the Boston Garden floor in his All-Stars, and, much later, in the bright dawning of another era, Larry Bird and Magic Johnson collided in the most unforgettable NCAA final in history - but not until they had laced up their chucks. Chuck Taylor loved his work and never got a dime of commission. He was on salary from Converse and lived in motels. For years, his only permanent residence was a small locker in the company’s Chicago warehouse. When Taylor was inducted into the Basketball Hall of Fame in Springfield, Mass., in 1968, he was better known than the local physical education instructor, James Naismith, who had hung a peach basket from a gymnasium balcony and invented the game. A year later, never sick a day in his life, Taylor died in his sleep at age 68. The world was changing, although Taylor - and Converse, for that matter - probably wouldn’t have believed it could turn against the most popular basketball shoe ever. The 1970s brought several booms to the footwear industry, but with millions of Americans becoming more interested in fitness, the biggest was the running boom. Converse ignored the trend, but other companies didn’t. Adidas and Reebok made sales inroads, and in Oregon, a track coach borrowed his wife’s waffle iron to make a prototype running-shoe sole for a new company named Nike. Basketball shoes began to change, too, with companies using other materials for their products. Leather came into wide use, providing more support and stability and sounding a death knell for canvas basketball shoes. Converse had other problems. The firm changed hands at times, often landing in the lap of holding companies that had little interest or expertise in sports or footwear. It was taken over or purchased by Allied Chemical and by companies that made, among other things, ribbons, electronic items, car parts and furniture. At the moment, Converse’s holdings are controlled by Apollo Capital Management, a New York financial group. Converse found itself tied to manufacturing plants in the United States while competitors were having their products made more cheaply overseas. And without a foothold in the non-basketball markets, it didn’t have extra money for a lot of adverstising or marketing. Bird, Johnson and Julius Erving were all Converse spokesmen — Dr. J called the shoes “limousines for the feet” in one commercial — and they helped the company shift its focus to leather basketball shoes. But the brand was saddled with a dowdy image, the vague odor of musty canvas still clinging to its product line. Converse cut corners to stay afloat, trying to undersell competitors that it couldn’t beat otherwise. With its modern product line overwhelmed by snazzier rivals, Converse had a brief financial resurgence in the 1980s, when “grunge chic” gave the nearly forgotten All-Star new life and a whole new audience. Rock star Kurt Cobain wore chucks on stage, and the old shoe suddenly began turning up on TV shows and movie screens. Fashion is a fickle savior, however, and All-Star sales have plummeted again. In the last five years, Converse lost an estimated $162 million and piled up debt on its financial ledger like driftwood on a deserted shoreline. The creditors are standing in a long line for repayment, among them First Union Corp, which is owed $74.3 million. (Even Dennis Rodman, who endorsed the company’s shoes, is owed $400,000.) But Converse closed the door on them yesterday, hoping to buy a little more time with its Chapter 11 reorganization petition. Approximately 1,000 workers will lose their jobs by March, when the domestic manufacturing plants are shuttered. Even less money will be available to advertise the shoes and get them on store shelves. And, except as a curiosity of another time or a collector’s item bartered on the Internet, the Chuck Taylor All-Star - the shoe that once left the imprint of its diamond-patterned sole across the country like the footsteps of a colossus - might be leaving the gym. Bob Ford’s e-mail address is bford@phillynews.com.